The show is open til 7 on Friday night (and Sat night) and from 10-3 on Sunday - admission is $10 per day or $25 for all three days. 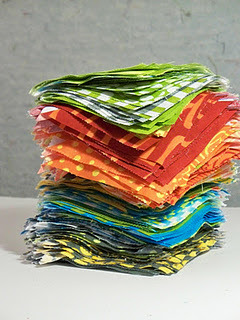 Fabric Shack is open 12-5 on Sunday. Leave sometime Friday afternoon and just get ourselves to the hotel. go to show from 12 or so on. Costs: For 4 people in a hotel room (2 double beds) the cost would be $66 hotel, approx $25 for gas, $10 show ticket = about $100 plus food at about $120 for three days totals $220. Having only two people in a hotel room would add $66 total to your trip. I based hotel costs on the Milennium Hotel since it was the cheapest and it is across the street from the show. When I tried the online reservations it said there were no quad rooms left, but I called and they said quads were still available. I have a slight preference for Option 1 since it gives us all day Saturday for the show. The last time I went to this show when it was in Chicago, I was there for about 5-6 hours, whipped through the vendors and still only got to about half of them. We should try to make our decisions soon as the hotel will fill up and it just makes it more complicated if we are farther from the show. Either leave comments to this post if you have questions or email me. Next Sew-In: February 12th, 12 - 4pm at Maker Works. 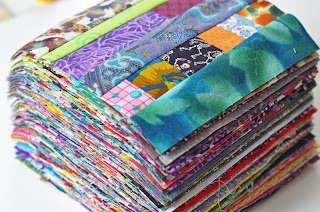 What to bring for the next meeting: If you want to participate in a charm-square swap, bring 12 charm squares (5") all of the same fabric to the next meeting. 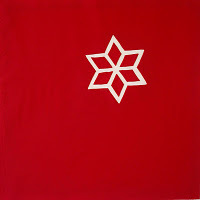 Also - think of a theme idea for a future guild challenge. It could be something abstract ("Rain!") 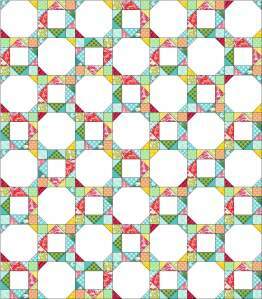 or more direct ("Squares!"). We will select a theme at the next meeting and discuss this challenge further. 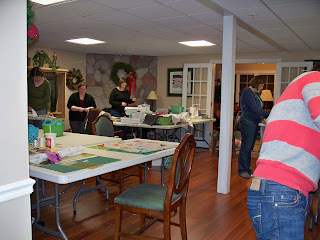 Discussed the January Retreat and are planning another weekend trip in the end of June. 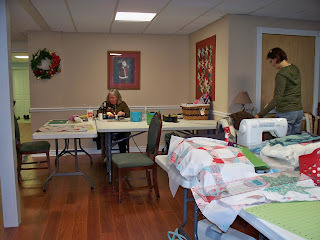 Evaluated the progress of our Jay McCarroll Habit Charity Quilt - will be basted at the next sew-in and quilted by Natalie. 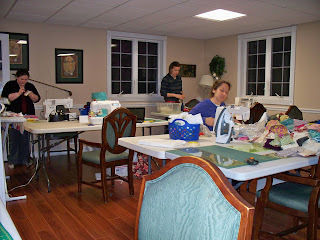 Discussed road trips to future quilt shows throughout 2012. 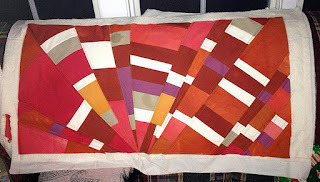 There is a Tangerine Tango Quilt Challenge happening on flickr, also with the deadline of March 2. 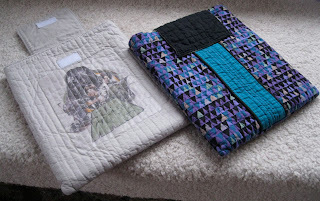 You can enter 1 mini-quilt (pillow, runner, etc...) and 1 larger quilt. More information HERE. 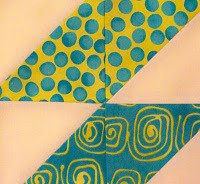 Discussed pressing: do you press toward the darkest fabric or do you press your seams open? Why? Debbie often chooses to press towards the darkest fabric, but advises you to make the best decision based on the quilt pattern - sometimes you have to press the seams open when the intersections of blocks prevent nested seams. Discussed the best batting options for blankets that will be hand-quilted: Kathy recommends Quilter's Dream Cotton Select or Wool. There were 1000 goodies consumed in honor of the beautiful Emily's birthday, and we were all elated to have the young Miss Penelope join in our discussions. There's a meeting this coming Wednesday! Hope to see you there. 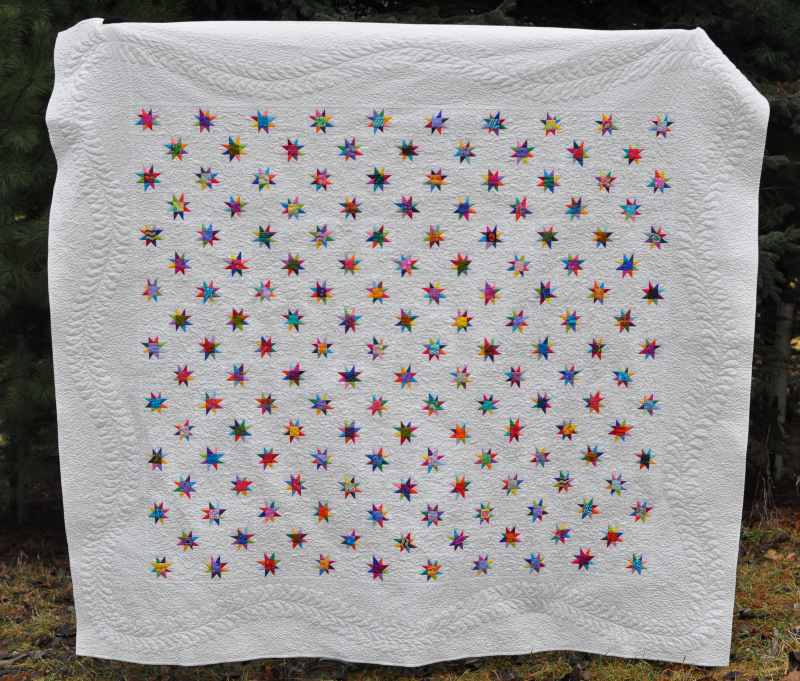 Debbie has this beautiful Christmas quilt completed a stunning 11 months early for next year's celebrations. 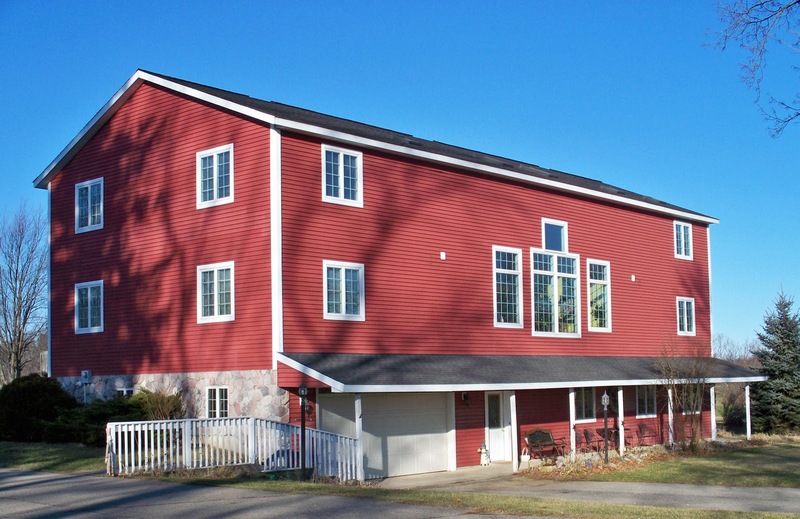 : ) Love the design here - almost looks a little like houndstooth, no? 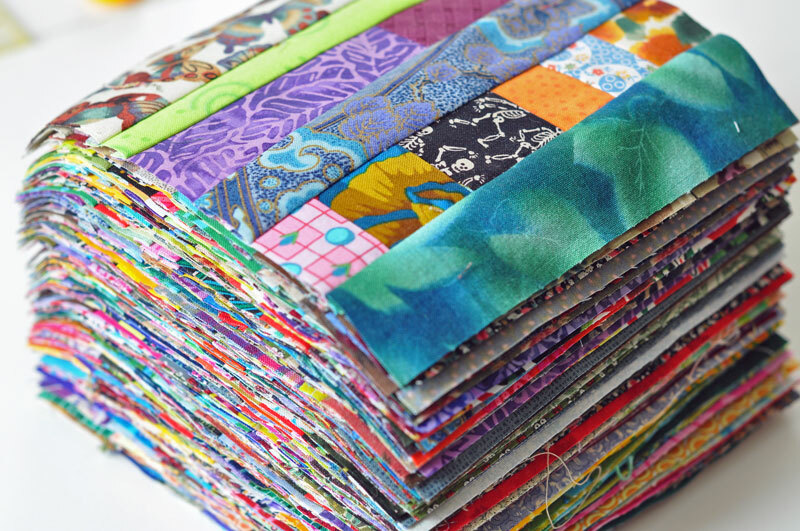 She also is playing with a stack of Malka Dubrawsky fabric, which makes me crazy jealous. Did you know you can stalk Brenda's Bust Yo Scraps quilt-along participants over on flickr? Check it. She also has a warm and wonderful looking Folksy Flannel quilt to show. Love it - wish I had it - I'm *chilling* out in front of the space heater right now! 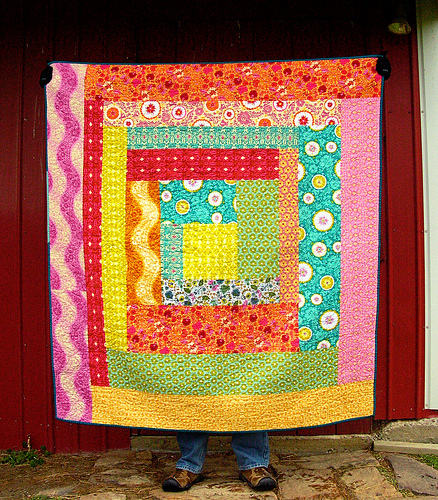 Lynn has a stunner here with this Crazy Love quilt. 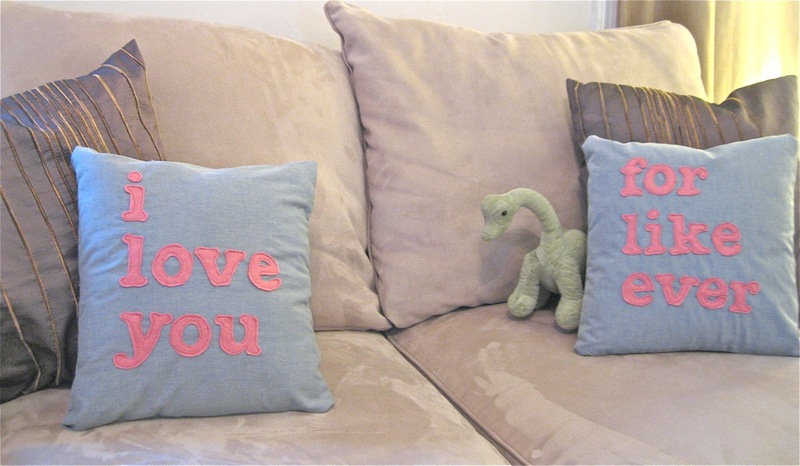 So gorgeous and I love the color choice and placement of the Kaufman blue fabric. Awesome! Lynn also reported on her productive time at The Retreat - she made 50 tiny stars! Whew! 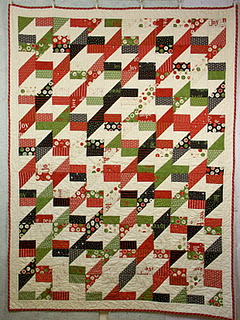 Kathy blogged about her gorgeous "Daisies in Kaffe's Garden" quilt that we were lucky enough to see in a recent meeting. So beautiful and the quilting details really are the perfect touch. 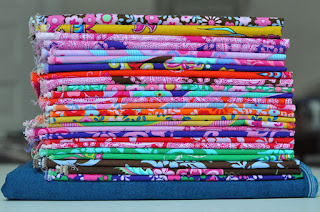 I'm so excited to see some sewing going on over on Rossie's page. Check out this awesome quilted pillow she made for a friend! 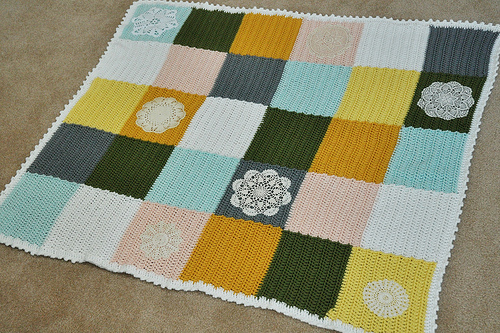 Definitely inspired by this sunrise layout. 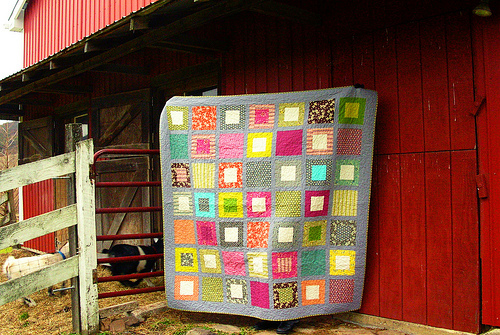 And Ronit has this lovely "Organic Imperfection" quilt, which also has a super-cool backing. 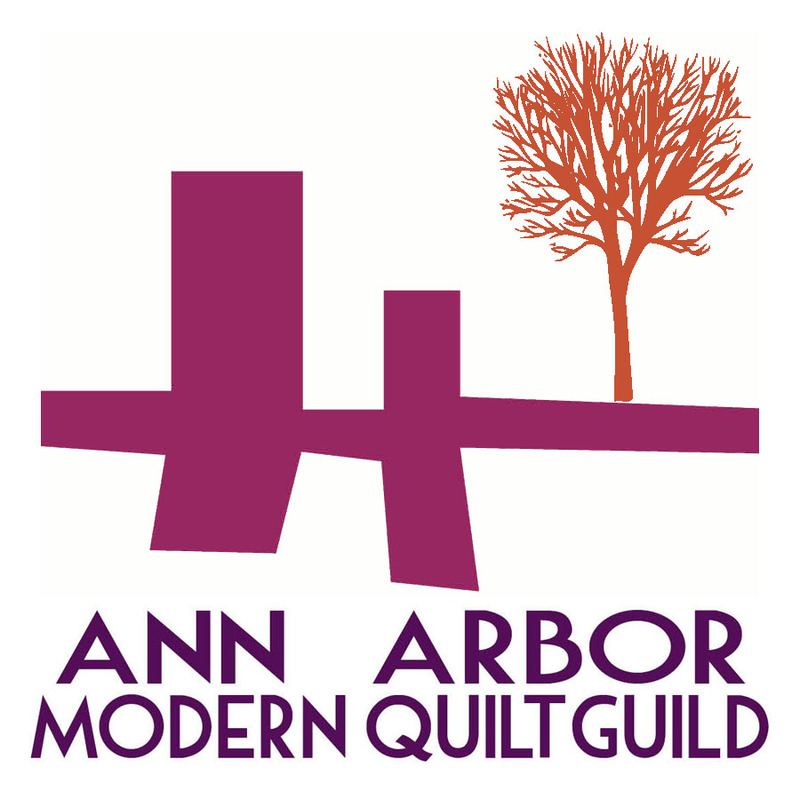 The first Ann Arbor Modern Quilt Guild retreat has come and gone! 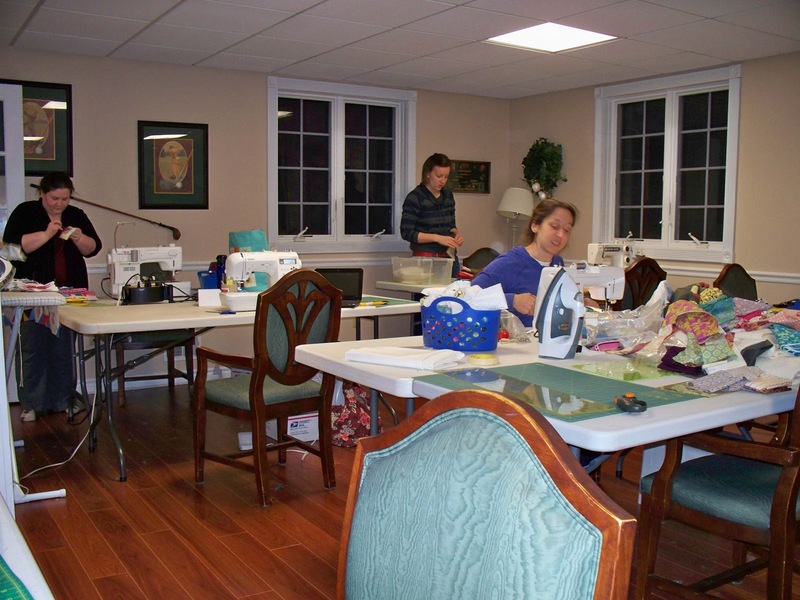 Eleven of us (eight from AAMQG and three modern quilters from Canada) had a great time sewing and sewing and sewing some more. 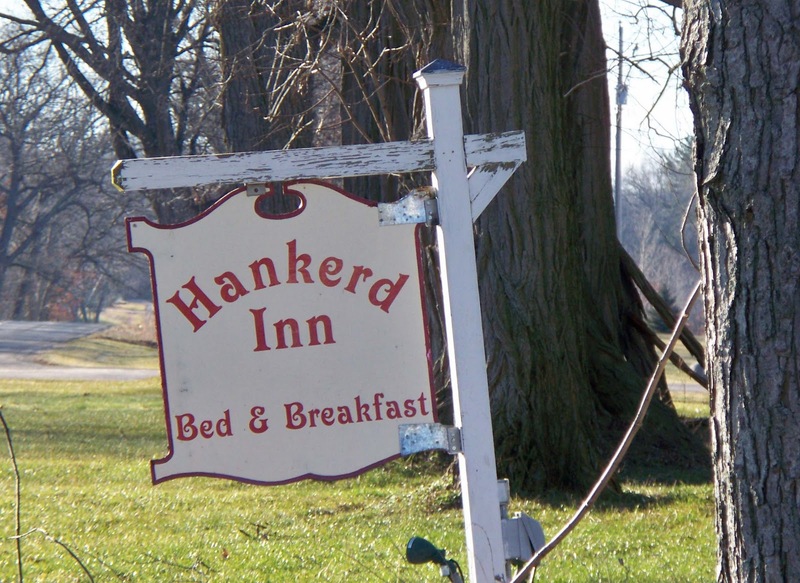 We went to the Hankerd Inn just west of Chelsea, MI. 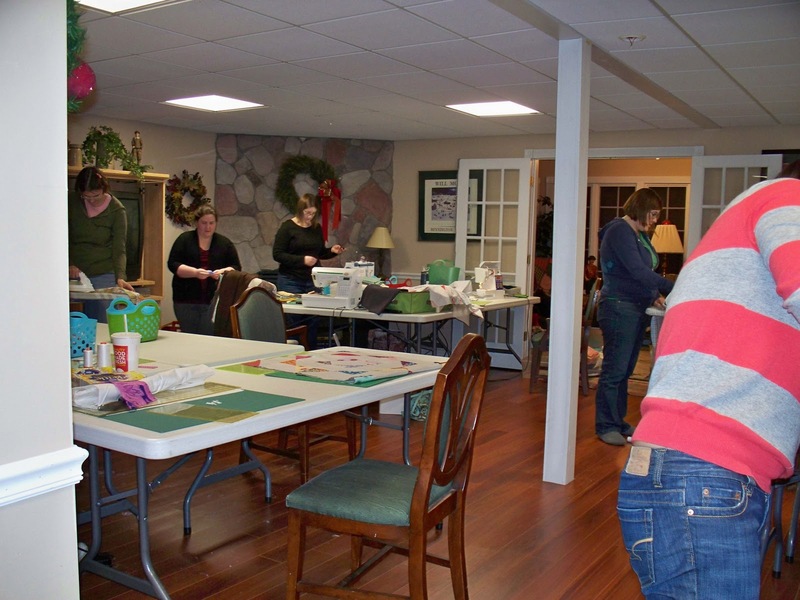 It is a lovely facility with wonderfully spacious rooms, a great sewing space and yummy meals provided. I hope everyone is having / had a great time at the retreat who was able to go! I am so excited to hear all about it and to see the projects that were worked on during the festivities. 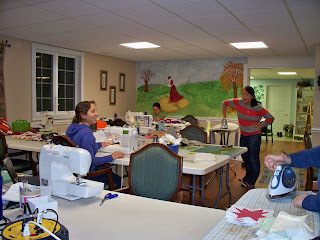 Debbie has a new applique project in the works. 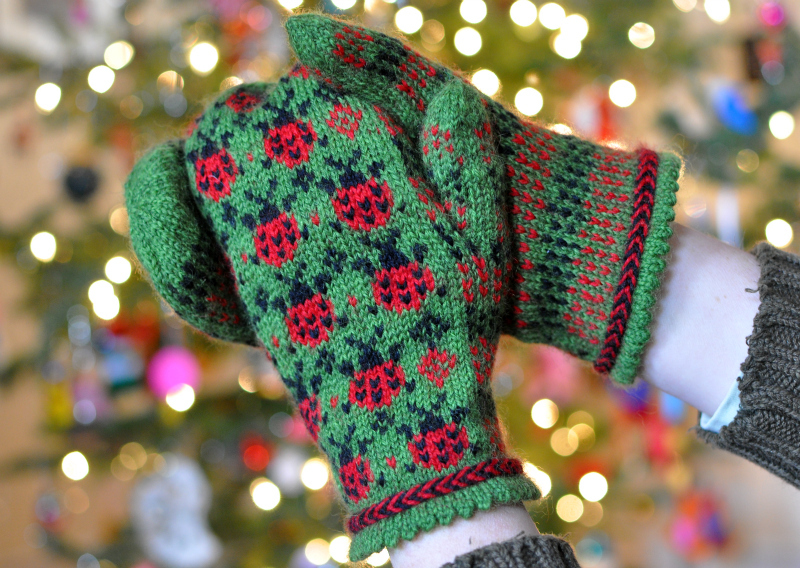 Her precise stitching is an inspiration! And check out her blog for a mosaic on many of her 2011 completed projects - also very inspiring! 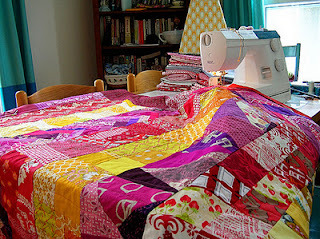 Brenda is continuing her "Bust Yo Scraps!" 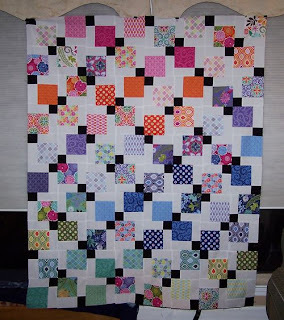 Quilt-Along - such a fun looking project! Natalie has a very lovely new quilt to show. Love the colors! And she also has a broken rib, which sounds awful. Feel better, Natalie! 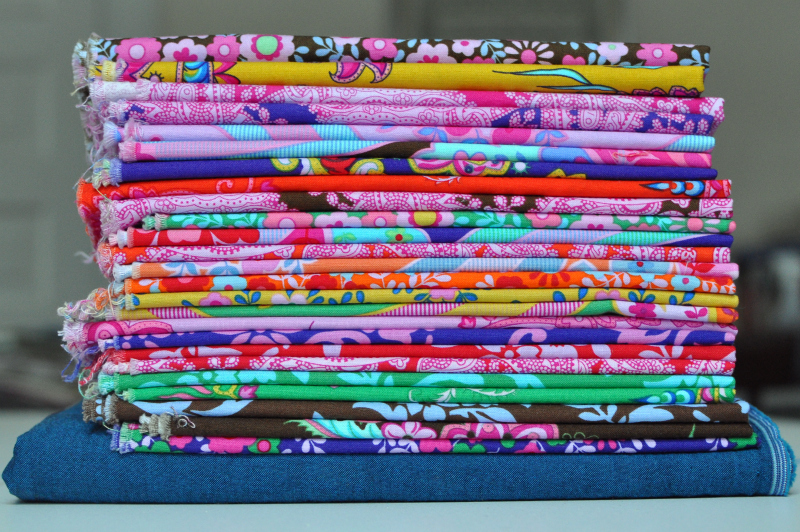 ... a new stack of beautiful fabrics for another Jennifer Paganelli quilt. 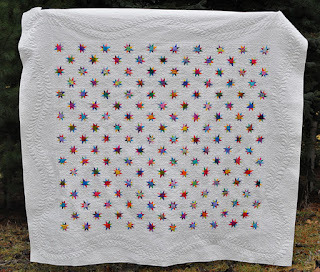 and she has this lovely Twinkling Stars quilt completed! Gorgeous! 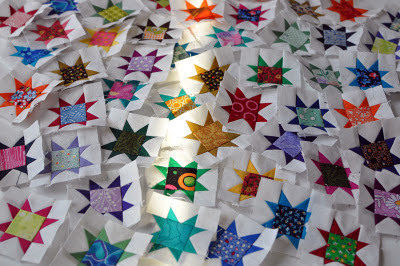 Kathy has an absolutely stunning Word Play Quilt in the works! 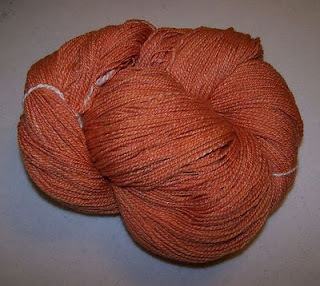 I'm very excited to see how this one comes together. 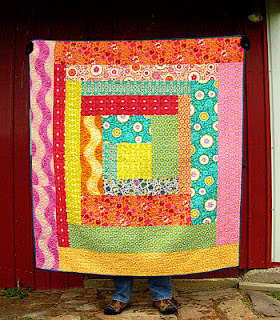 Becky has this really awesome quilt to show - I am nuts for the rainbow effect made by the fabric placement. So beautiful! 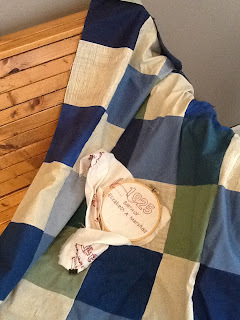 - and check out the back! Stellar! 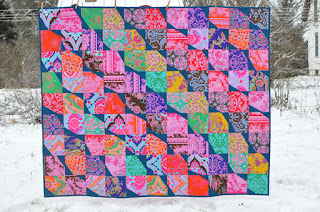 She also has an inspirational end-of-the-year mosaic posted, and check out these adorable heart blocks! 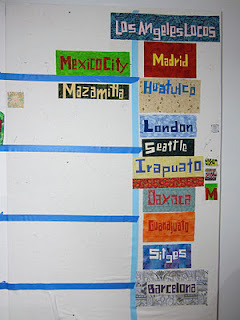 And I had a 2011 mosaic posted, too - and not much else! Hopefully by next week I'll have some show and tell.